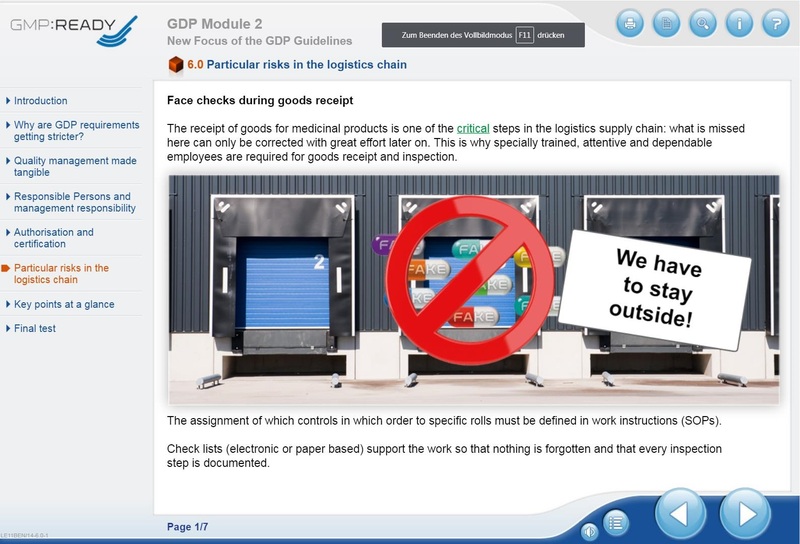 With this e-learning course you can get familiar with the topic of Good Distribution Practice (GDP)! The aim is to explain the GDP-Regulation principles in a quick and sufficient way. Are you looking for a way to train yourself or your colleagues sufficiently? 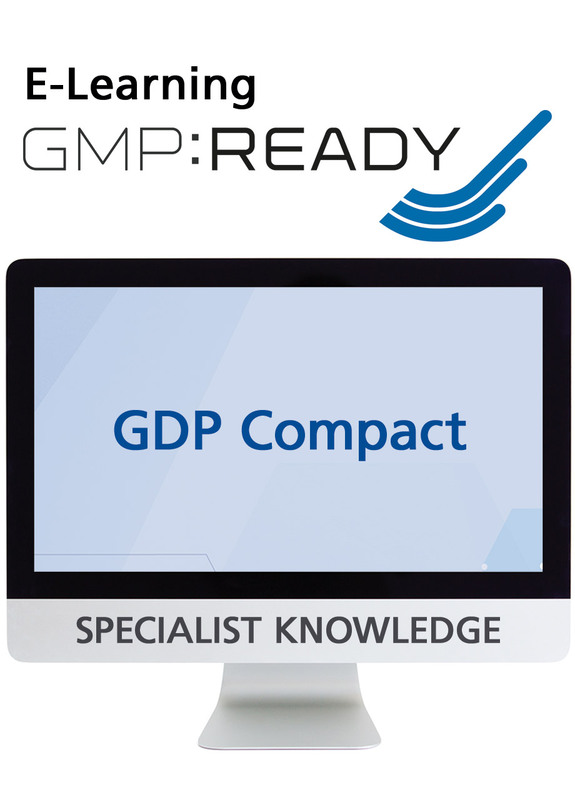 Your personal experience will be interactively linked to GDP specific aspects. This knowledge transfer makes it easy for trainees to remember subject matters. Demanding exercises improve the learning process of the concentrated knowledge. The content gives concrete instructions for your work. 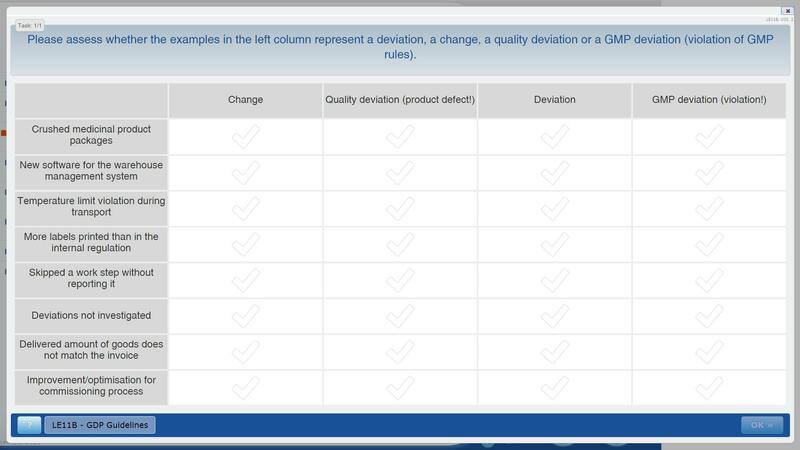 Important aspects are the GDP regulations, qualification and validation, documentation, recording, responsibilities and behaviour at deviations. Personal Certificate: Upon completion of final test. In Part A “Basic GDP Requirements” you will familiarise yourself with the basic requirements for the transport and storage of pharmaceuticals. Chapter 2: What is GDP good for? In Part B “New Focus of the GDP Guidelines” you will get to know the focal points of the new EU-GDP guidelines. Chapter 2: Why are GDP requirements getting stricter? After the completion of both chapters, you will be familiar with all essential GDP regulations. The training contents are accessible for 12 months after the activation date for your review. Complies with the obligation to provide evidence in accordance with Article 7(4) of Directive 2003/94/EC. Suppliers and service providers, above all the dispatchers and QM representatives of logistics companies who cooperate with the pharmaceutical industry. Career changers switching to the GDP sector. People who want to bring themselves up to date on the current status of the EU-GDP-Guideline. 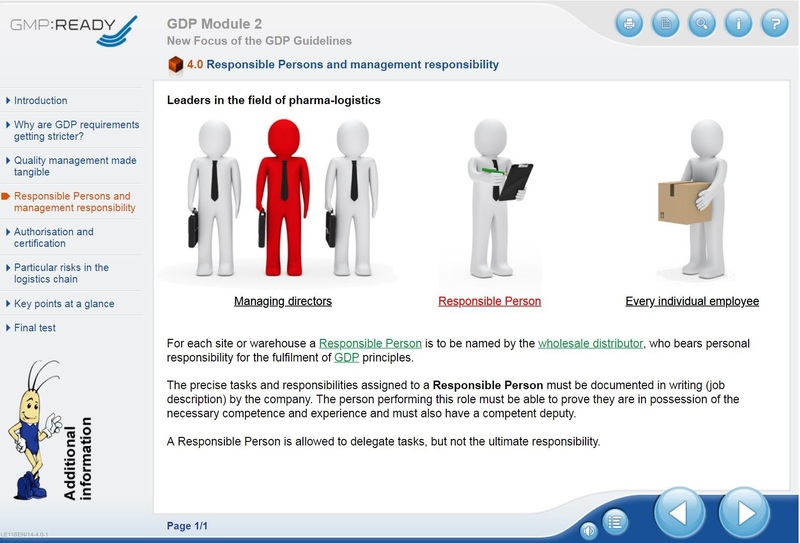 You can easily access the e-learning tool GMP:READY - Good Distribution Practices on the internet via user name/password.